Trick shooters rejoice! Dude Perfect from BlackBox Interactive is a new iPhone game inspired by the now famous group of college guys who became YouTube stars making insane basketball trick shots in unusual places. If you think the half court shot is impossible, wait until you watch some of the videos on YouTube that the Dude Perfect guys have put up. 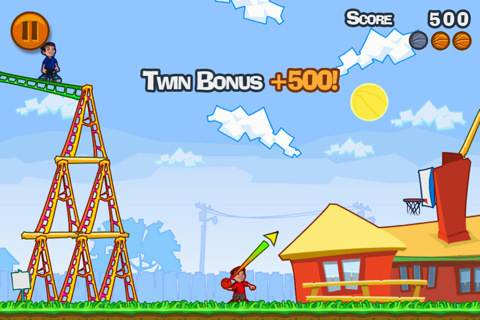 The Dude Perfect iPhone and iPod touch app, is a 2D arcade style game that brings those same crazy stunt shots to the iOS world. Forget about the perfect shiny hardwood floor of a basketball court. Dude perfect takes basketball to new extremes. Try making a bounce shot over a roof off a ladder and into a moving basket. Gameplay is simple. You have 3 balls to make a shot. Dude perfect, uses an Angry Birds style of gameplay where you drag and release a basketball towards a target basket, trying to make the craziest shot you can think of as you bounce off various objects. Pull one finger from top to bottom and drag to aim your direction and shot strength, then release. The basketball physics are very sensitive so it takes practice to get the right strength and aim. After each throw a guide arrow appears showing your previous path so you can fine-tune your next shot. The ball bounces around hitting things and earning you points, but your points all disappear if you don’t sink the ball. I wish the ball would stop bouncing quicker after a miss, since you don’t get any points anyway. You have to sit there and wait for it to stop bouncing around. The graphics in the game are clean and professional, though the mutable soundtrack gets a bit annoying. The comments you hear after you finally make a trick shot, like “You’re Good!” and “That’s what I’m talkin’ about.” are pretty amusing. You need to earn points and 1-3 stars per level to move to the next one. Earn points by doing as many crazy things as you can before sinking your shot. You get 3 chances per level and you’ll earn points for any remaining balls when you complete a level. Another helpful feature would be to optionally receive 5 attempts per level. 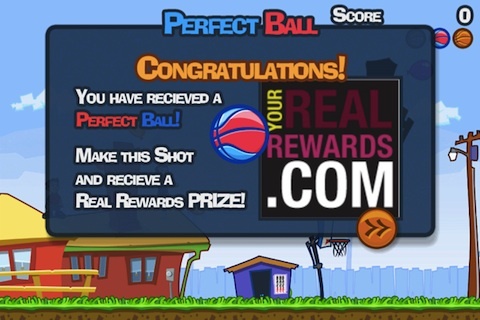 The Dude Perfect app has integrated the YourRealRewards.com prize system, where you can win real world prizes for making trick shots at random times in the game. Prizes are for things like cameras, toys and apparel. You can play in either single or two player (local or online via GameCenter) mode. Unfortunately I could not play online MP mode, since GameCenter couldn’t locate anyone else to play with. There are 4 stages called “locations” with increasing difficulty, Basics, Backyard, Ranch, and Camp. Each stage has a set number of levels. Basics starts with 4 levels to get you warmed up sort of like a tutorial stage and the other 3 stages have 12 levels each. Another level called Panda can be bought via in-app purchase for $0.99 in the game. An iPad version of Dude Perfect is sold separately for $1.99 in the App Store. AppSafari review of Dude Perfect was written by Joe Seifi on April 1st, 2011 and categorized under App Store, Arcade, Games. Page viewed 5266 times, 2 so far today. Need help on using these apps? Please read the Help Page.